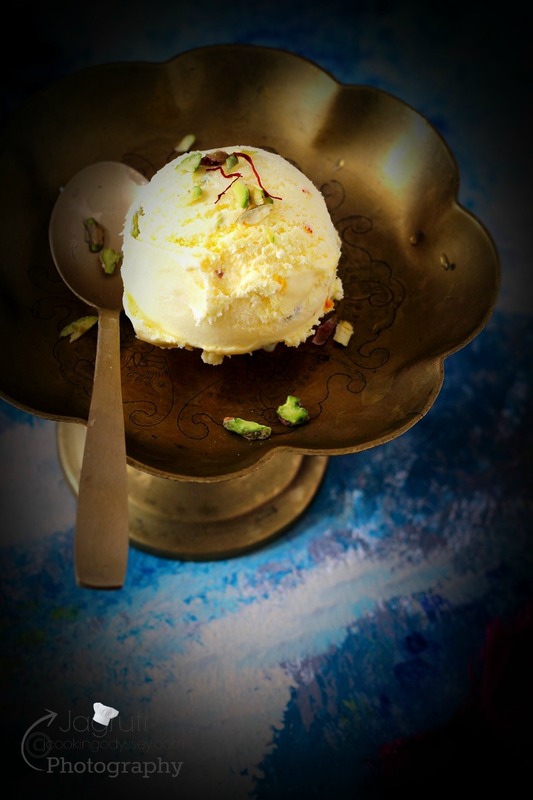 Kesar Pista Ice Cream, it's classic and one might say it's an ancient item and I believe it's perfectly even fit for the Gods, if he is watching you having it, even he might get jealous of you :) ! 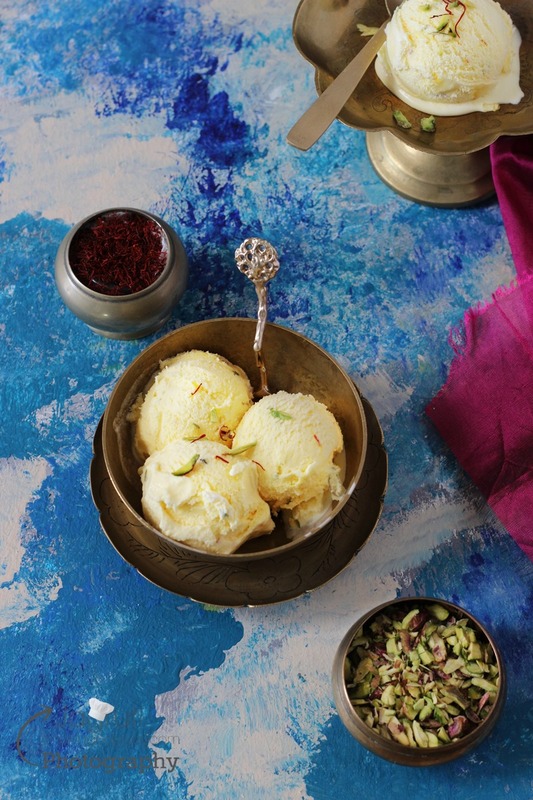 Kesar Pista, the 'King of the Flavours' in Indian desserts. 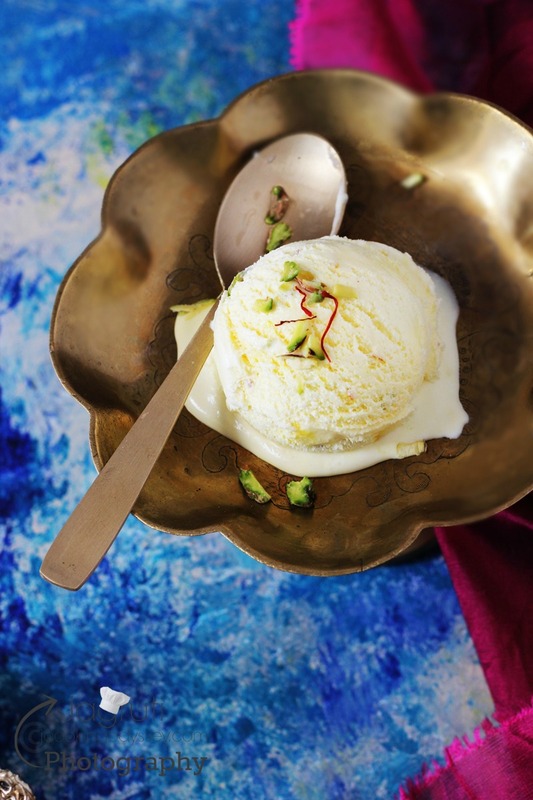 Truly delicious, taste buds-teasing, rich yet very light and has beautiful and aromatic flavours of saffron and pistachio in it. It is so yummy and addictive, one might help themselves for seconds :) after all it's frozen ambrosia !!! 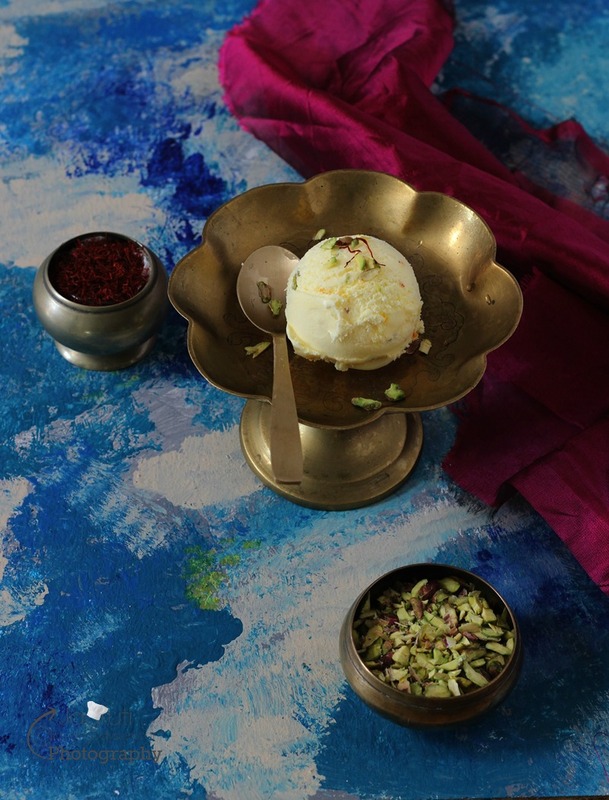 There are plenty of foods along with Kesar Pista Ice Cream, that I don't think about ever that has got erased from my childhood memories, Kesar Pista Ice Cream , connects to me with my happy childhood, and the very thought of this food makes me so nostalgic that my heart, mind and taste buds that literally craves for it. Kulfi, Ganne ka ras (Sugar cane Juice ), Baraf ka Gola ( Shaved ice with flavoured sugar syrup ) are such a food that make me go back to the yesteryears. We siblings would wait for the scorching day to be passed, so in the evening after dinner we could go out for a walk to get fresh and cool air with parents and buy any of the above item. Almost every day we can have Ganne ka ras or Baraf ka Gola which was cheaper and once a week dad would buy us ice cream. We would sit and decide which flavour we would like to have, and without fail I would have Vadilal Kesar Pista or Kaju Draksh ( cashew and raisins ) , somehow chocobar , butterscotch or Rajbhog didn't appeal to me much, it could be the high price !! 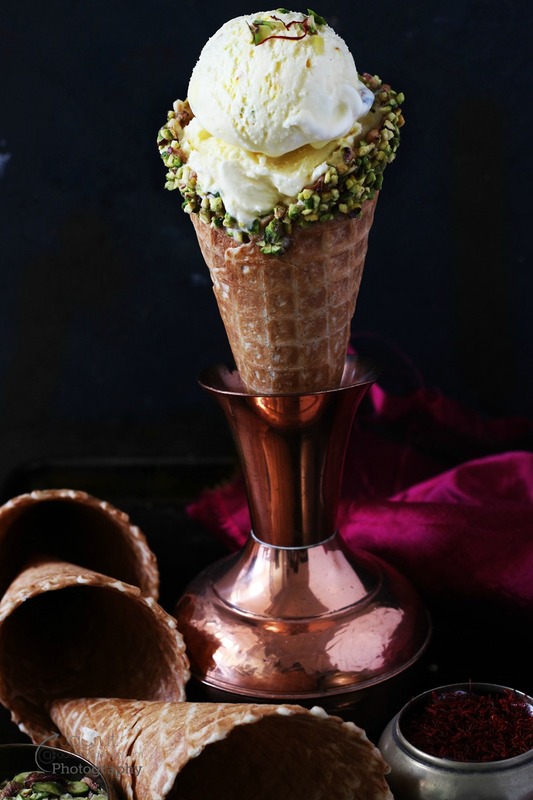 Then me and my brother would rush to the Ice cream parlour and hurried quickly and then we would blissfully lick this throat cooling, soft and smooth yummy ice cream to our heart content ! 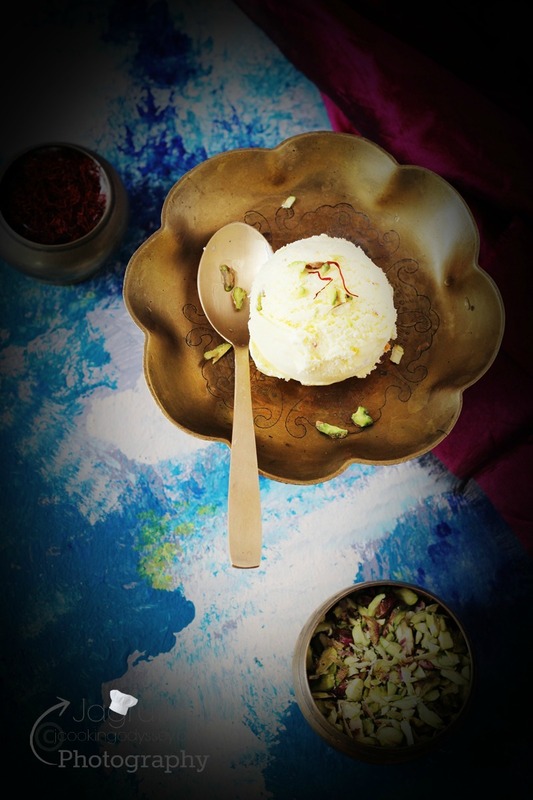 After we came back from India in 2012, in the next summer she asked me if I can make Kesar Pista Ice Cream, although she is crazy for Cookies N Cream and can make it herself without me knowing she can churn that ice cream any time :) When she asked, I was more than happy to churn this sinful dessert. 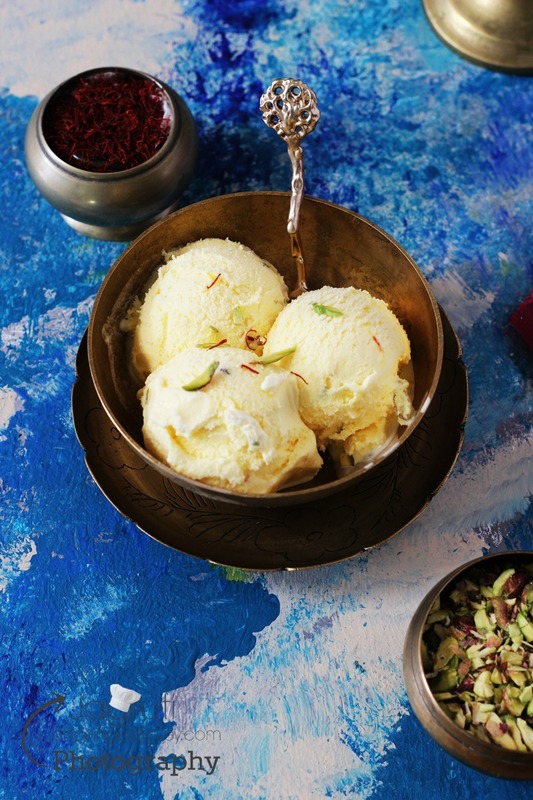 In many parts of the world summers are at peak, and nothing beats the heat especially for kids than doses of ice cream. 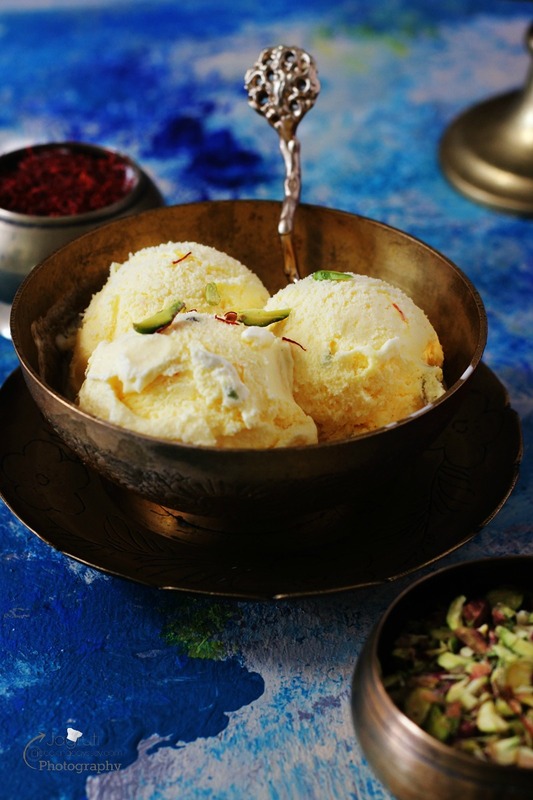 Home made ice creams proves it's freshness and shows what kind of efforts you are putting. My all home made ice creams, Dulce de leche Ice Cream, Vanilla Ice Cream are pure vegetarian, without eggs or even custard or corn powder. 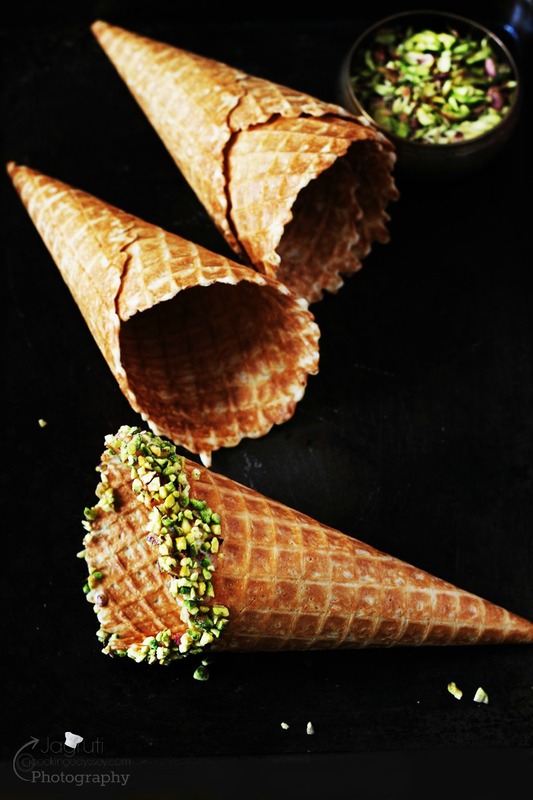 I make ice cream with minimum good quality ingredients and small fresh batches every time with very easy method. So hey guys, if you haven't tried this flavoured ice cream or have tried but never made at home. now it's a right time. 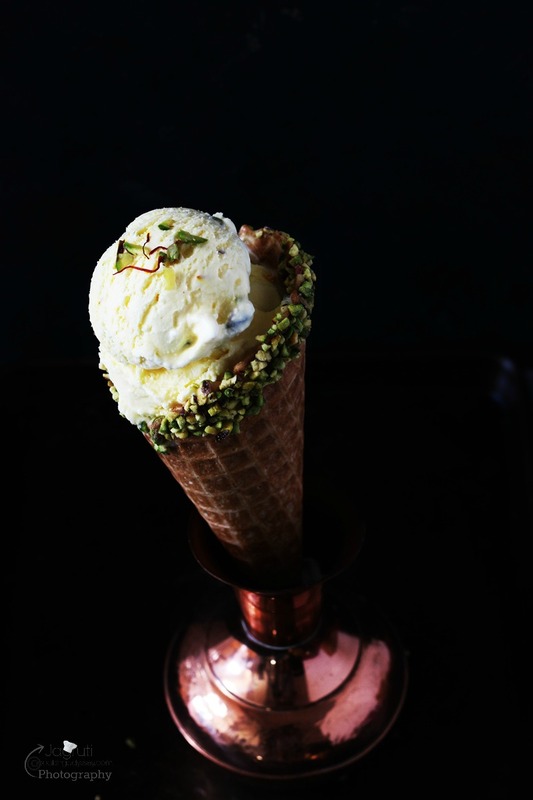 Keep yourself and family too cool and earn those brownie points from your loved ones try this, an ultimate and perfect summer treat and yes, let's beat the heat together, however in our neck of the woods yet we have to see warmer days !! 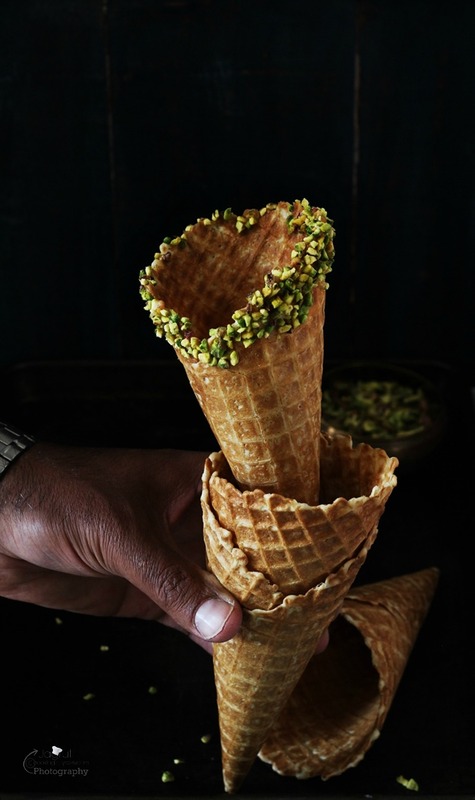 Saffron and Pistachio flavoured Ice Cream, on every bite , feels like heaven is on Earth !!! 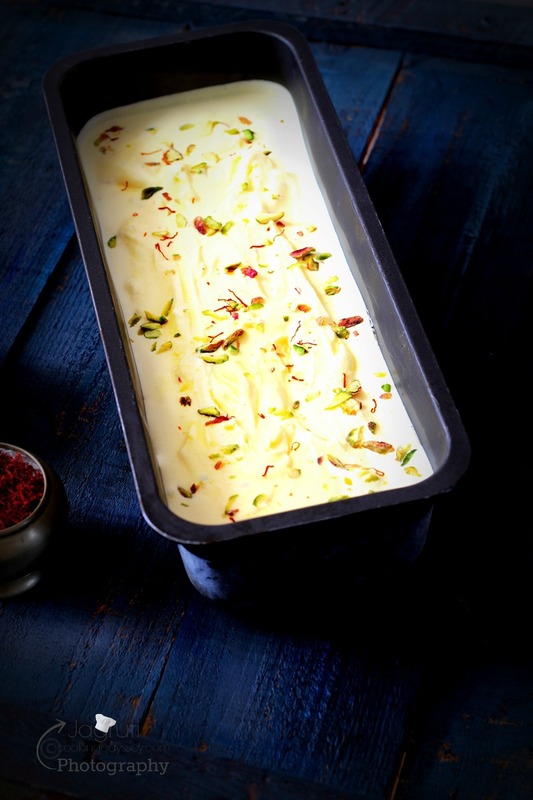 Combine milk, sugar and saffron in a one bowl and whisk until sugar dissolves. Then add double cream and gently mix everything. 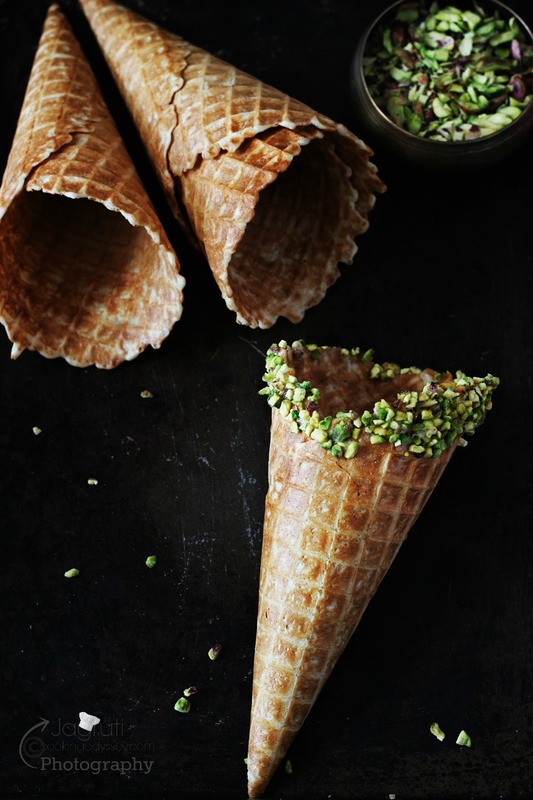 Place freezer bowl into ice cream machine and add cardamom powder and Pistachios into liquid. Turn the machine on and transfer liquid into the ice cream maker and follow according to manufacturer's instructions. 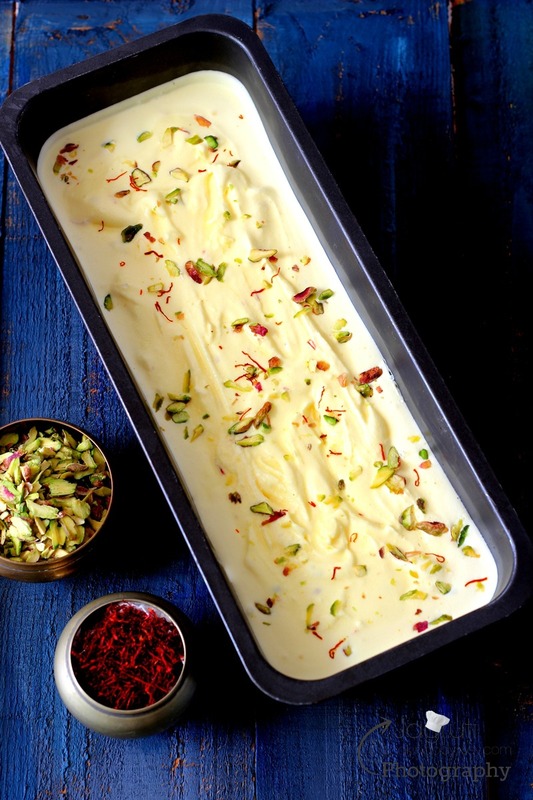 My ice cream maker produces soft finish, so for firmer texture I freeze the ice cream mixture into airtight container, garnish the ice cream with the saffron threads and pistachio nuts and freeze for at least an hour. 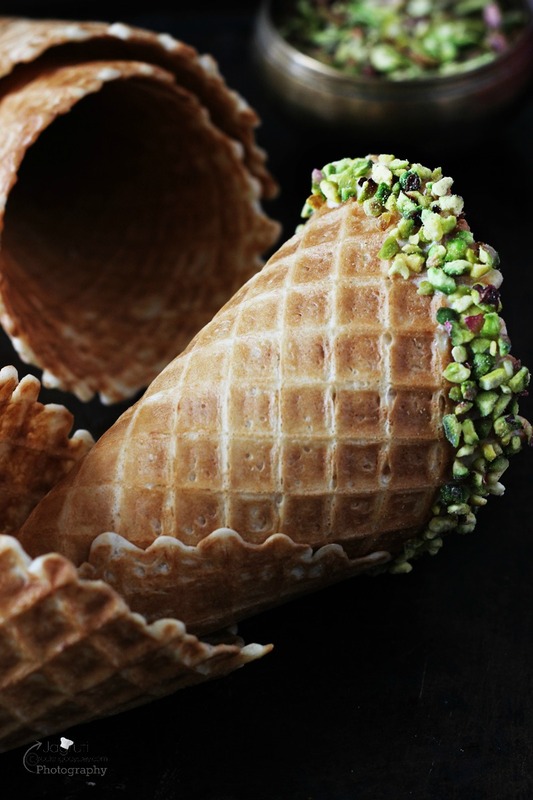 Ice cream is ready without any crystals. Your recipe bring back all my childhood memories. Used to enjoy at Satyavijay Icecream, local ice cream store in Rajkot. 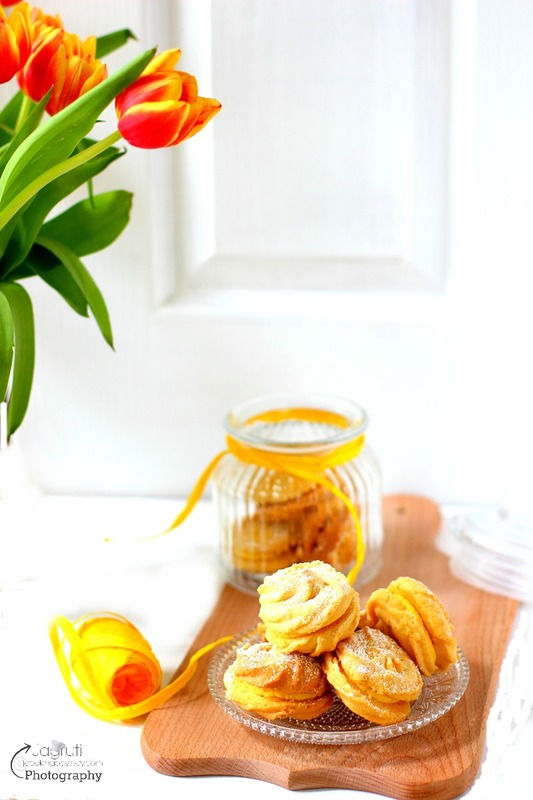 Thanks for sharing wonderful recipe. I can't resist my self to give it try. Just quick question double cream is same as heavy whipping cream? Or is it something different? Hi SRK, lol for a second I thought Shah Rukh Khan has left the comment :) Thank you for visiting JCO. Glad to know that you also like this flavour too. Yes, double cream as same as heavy whipping cream.